While the event of the attack on the Copts was ongoing, news presenters called on Egyptians to come to the aid of their armed forces, which were being attacked by “armed Coptic protesters, killing three military personnel and wounding many,” said broadcaster Rasha Magdi. The news bar read the same for over three hours. Angry Muslim young men from the neighbouring Boulak, Sabtiya and Ezbet el Safih in Ramsis, hurried to the help the army, chanting anti-Christian slogans and intercepting Copts in the streets and assaulting them with stones, clubs, and firearms, before going to Maspero to join the military police attack on the peaceful protesters. The Information Minister denied that military armored vehicles were crushing protesters alive. He denied it an interview with Al-Arabiya TV, only to be embarrassed by video footage showing army vehicles indiscriminately driving into crowds of Coptic protesters (Al-Arabiya video). The State television issued a correction in the morning after the protest, saying no army personnel were killed and it was the fault of the “nervous” TV presenter. Presenter Rasha Magdi appeared on an independent TV channel and said that she was given the text to read by a “big TV official” and was unaware of the clashes taking place outside the TV building. She admitted to being unprofessional by not mentioning how many Copts were killed. 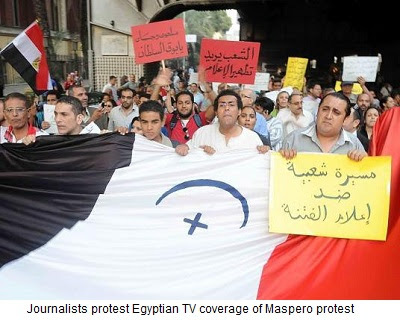 Hundreds of journalists, broadcasters and public media figures marched today from Sahafa (Press) Street to the State-run TV building in Maspero to denounce the “Sectarianism of the media,” calling for the resignation of the Information Minister and a clean-up of the Egyptian State TV, accusing it of igniting sectarian strife. Two days ago, Major Atman of the Supreme Council of the Armend Forces (SCAF) complimented the Egyptian state TV on its coverage of the Maspero incident. Please visit Assyrian International News Agency at http://www.aina.org for more reports and articles related to the Middle East, Christian persecution, human rights and news related to Assyrians.